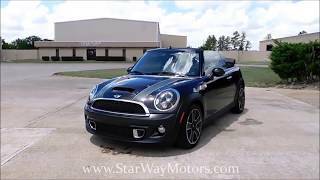 MINI is known world over for creating the ultimate as far as small cars are concerned. 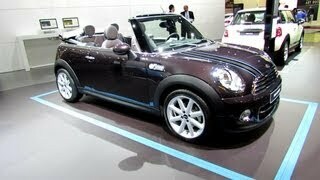 Following the launch of its Bayswater and Baker Street, MINI is coming up with its 2012 Highgate Convertible. 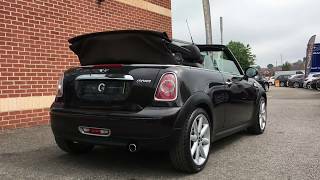 The 2012 MINI Highgate Convertible has a personality of its own and is quite distinct from the company's earlier launches as far appearance is concerned. But this is no way a new car as the car will not have any new technical specifications. 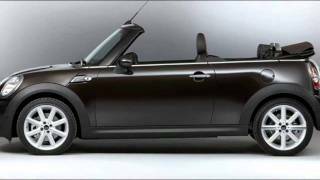 The car is just a cosmetic modification of the previous MINI Cooper versions. The biggest change, for sure, is that it is a convertible. So you will have a mobile roof-top with the Highgate. The car will wear a new metallic appearance as it has been given a coating of the new Iced Chocolate color, with black and brown stripes and blue edging over the hood. If Iced Chocolate is not your thing then you can also choose from Midnight Black and White Silver, which MINI is offering to the customers along with the Iced Chocolate option. The car will also be fitted with a pair of 17-inches Double Cross Light Alloy Wheels. On the inside, the MINI Highgate Convertible has been given Dark Truffle leather seats with contrasting stitching effects and blue piping. The car will sport MINI's Chrome Line interior package. Apart from that Suntouched Brushed Alloy interior trim and stainless steel pedals are also there. The Highgate Convertible will be offered on four different variants of the Cooper – the standard version as well as on the Cooper S, Cooper SD and Cooper D variants. The Highgate will set you back by $2,750 on the standard version and by $2,500 on the Cooper S. The car will be launched by March this year and deliveries will begin a month later in April. Hot on the heels of the MINI Baker Street and MINI Bayswater comes the third in a trio of special editions for spring 2012 – the all-new MINI Highgate. Continuing the brand’s established policy of taking the names of fashionable areas of London, the Highgate is a sophisticated new version of the drop-top Convertible. As with all special edition MINIs, this four-seater offers a raft of unique exterior and interior features. Providing a fresh interpretation of MINI’s premium appeal and style, the Highgate is designed to take the fun and excitement of ‘wind-in-the-hair’ motoring to the next level. The car is finished in an all-new metallic ‘Iced Chocolate’ body colour, which works perfectly with the tailored ‘Silvertouched Truffle’ fabric roof. The distinctive look is enhanced by truffle bonnet stripes with blue edging. Midnight Black metallic or White Silver metallic paintwork can be specified as an option. The door mirror caps are always finished in the same shade as the exterior. Also unique to the MINI Highgate are 17-inch ‘Double Cross Turned’ light-alloy wheels in a subtle aluminium colour. The design team took its inspiration for the spokes from the Union Jack flag. Inside, the ‘Dark Truffle’ Lounge Leather seats feature blue piping and contrasting stitching. MINI’s popular Chili Pack; filled with added extras like automatic air conditioning, Bluetooth and USB connectivity, multi-function steering wheel, multi-coloured interior lights, is standard on the Highgate special edition. Sun-touched Brushed Alloy detailing on the dashboard and the Chrome Line Interior and Exterior packages are also included. Exclusive ‘Highgate’ lettering on the side indicator surrounds, door sills and seat tags marks the car out from the crowd. 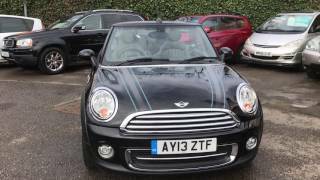 As with every MINI, customers can enhance the appeal of their car further using the extensive options list of comfort, convenience, design and technology features. The MINI Highgate is available with four engine options; the MINI Cooper (90 kW/122 hp), MINI Cooper S (135 kW/184 hp), MINI Cooper D (82 kW/112 hp) and MINI Cooper SD (105 kW/143 hp). All are linked to a six-speed manual gearbox as standard, with a six-speed automatic available as an option.